alaTest on kerännyt ja analysoinut 771 arvostelut lehdistä ja verkkosivustoilta. Amazon Fire HD 8 Kids Edition review: The best tablet for kids out there right now, thanks in part to the Fire for Kids app subscription and a robust case. Amazon Fire HD 8 review — A £80 tablet that makes a great low-cost family iPad alternative if you don't mind Amazon's software. The best sub-£100 tablet, as long as you can stomach the heavy-handed Amazon software. Unless you're immersed in the world of Amazon and all it has to offers, we'd look elsewhere besides the Fire HD 8 and Fire HD 10. Display isn't as sharp as the iPad's; to truly take advantage of what the tablet has to offer, you need an Amazon Prime membership; slow charging (takes 6 hours to fully cap battery). Simple user interface. Durable body. Works as an Echo Show. Amazon's app store falls short of Google Play. UI is very oriented toward showing Amazon content. The hardware is good, but Amazon's FreeTime Unlimited is the real star of the all-ages Fire HD 8 Kids Edition tablet. The Kids Edition costs significantly more than the otherwise identical standard version. There are the same app store limitations as the other Amazon Fire tablets, and no kid is going to prefer this to a (much more expensive) iPad. 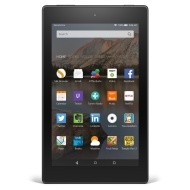 The previous generation Fire HD 8 started at $150 (£130 or AU$215). That model came with only 8GB of storage while this new one includes 16GB, with an expansion slot for adding microSD memory cards up to 200GB in capacity. Display isn't as sharp as that of current iPad Mini models; to truly take advantage of what the tablet has to offer, you need an Amazon Prime membership; slow charging (takes 6 hours to fully cap battery). Amazon's latest Fire HD 8 tablet is an excellent value for media consumption, as long as you can live without access to Google Play. Good value. Loud speakers. Dual-band Wi-Fi. Very easy to use. Highly focused on Amazon services. No native Google apps or services. Poor cameras.